WASHINGTON, DC USA -- PHARMA UPDATE NEWS SERVICE -- OCTOBER 31, 2017: The Pharmaceutical Compliance Forum's Eighteenth Pharmaceutical and Medical Device Compliance Congress, www.PharmaCongress.com, will be held November 6 - 8, 2017 at the Mandarin Oriental in Washington, DC. Registrants may attend the event in person or online (live webcast and archived for 6 months). Virginia "Ginny" A. Gibson, Esq. Click here for overflow hotels. 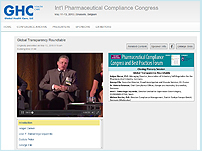 The Pharmaceutical Compliance Forum (PCF) is a coalition of senior compliance professionals and legal counsel from more than 70 of the largest research-based pharmaceutical manufacturers. The PCF was founded in early-1999 by compliance professionals from the pharmaceutical industry to promote effective corporate compliance programs. Compliance Professionals: This education activity has been submitted to the Compliance Certification Board (CCB)® and is currently pending their review for continuing education units (CEUs). Senior Director, Ethics & Compliance, North America, Ipsen Biopharmaceuticals, Inc.
Vice President and General Counsel, Pfizer, Inc.
For Congress registration information, visit http://pharmacongress.com/registration/, email registration@hcconferences.com, or call 800-503-7419. For sponsorship and exhibit information visit http://pharmacongress.com/promotional-opportunities/, or contact Justin Sorensen, Exhibit Manager, 206-452-0609 phone, 206-319-5303 fax, exhibits@hcconferences.com.